One of my early memories is of riding behind my uncle as he drove the tractor, plowing the fields. I loved to see the earth turn over on itself, forming ridges.I wrote this poem as a tribute to farmers and the farming life. furrow and ridge roll across the land. smoothing the land, grooming the earth. through cricket dusk, dreaming of golden grain. will shoot up into crops — wheat, rye, corn, soy. tractor pulls the cultivator, uprooting weeds. the farmer knows: time to rest the machines. rides them hard, racing against the weather. No time to lose, act quickly or lose the crops. thresh the wheat — gather, gather the crops. threatens to damage the entire yield. the harvest moon shines on stubble. creeks. Dusted with snow, they adorn Earth’s face. Earth collapses inward for a long sleep. Finally the snow melts, though frost remains. Days grow longer and warmer. The farmer checks the tractor and plow. embraces herself row after row. Barbara Gregorich has published one book of poetry: Crossing the Skyway. In 2009 I became interested in self-publishing, and after exploring the options, I reprinted She’s on First as a self-published book in February 2010. But while I couldn’t afford to reprint Women at Play, I could afford to put together and publish a new book, one that consisted of my research notes — the raw materials from which I sculpted Women at Play. Such a collection of newspaper articles, posters, diaries, and letters would, I felt, interest baseball researchers. Also, I thought such a book would interest English teachers at the junior high, senior high, or college level. A collection of original sources, all on the same topic, could prove valuable to those who teach the research paper. Excited about this, I started to put together my concept of the book. Almost immediately I realized that this was not a one-volume project. Rather, it would take three volumes — because I wanted to keep each book at about 150 pages rather than publish a large-format, 450-page book. From the get-go I decided what each volume would logically contain, starting with women ballplayers of the 19th century and moving forward to the early 1930s. 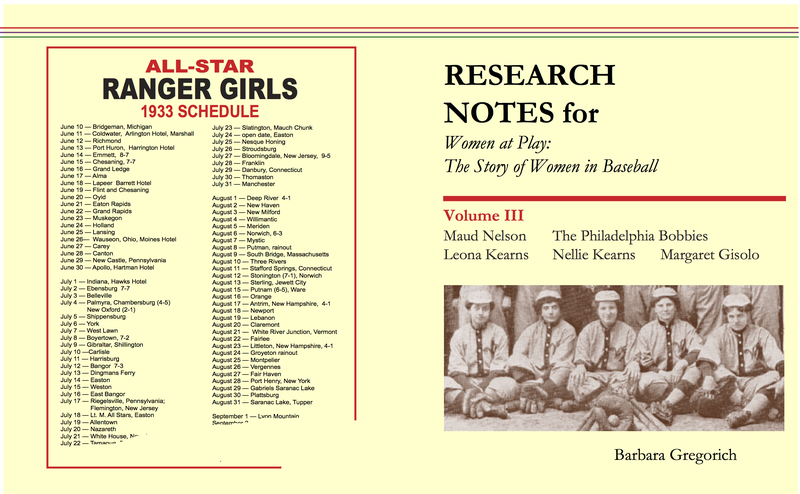 Research Notes for Women at Play, Volume 1, contains articles on Maud Nelson, the most important person in the early history of women in baseball; on Margaret Nabel, founder of the New York Bloomer Girls; and on the African-American players of the Baltimore Black Sox. 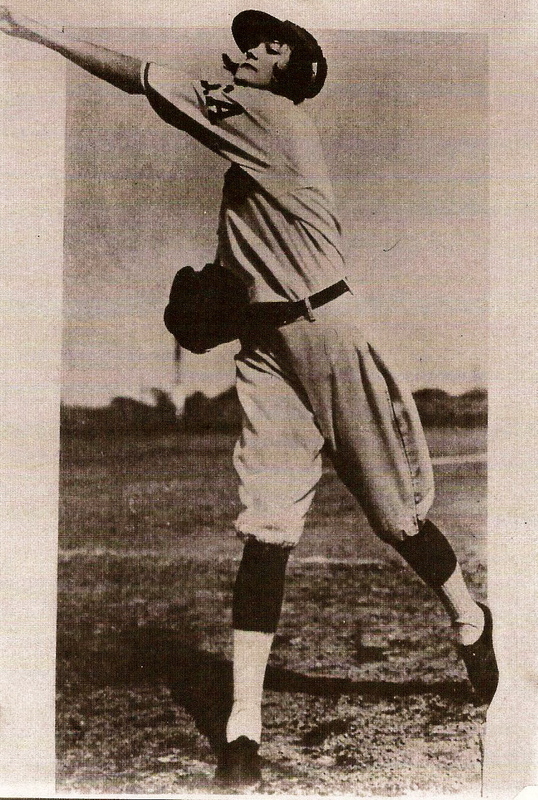 It also contains articles on John Olson, Maud’s husband, founder of the Cherokee Indian Baseball Team (though they were really Seneca Indians). I published Volume 1 in November of 2010, and I thought I could publish Volume 2 by 2012. As it turned out, Research Notes for Women at Play, Volume 2 took me longer to put together: it was published in July 2013. Finally, in October of 2015, five years after I published Volume 1, I’m publishing the third (and last) volume of Research Notes for Women at Play. Because all of the information in Volume 3 comes from the years 1925-1935, none of it is public domain. This means that I could quote only modest amounts of most articles: it means that I spent a lot of time writing accurate summaries of article contents. But Volume 3 is different from the two previous volumes in another way, too. A reader going through it from beginning to end may feel she or he is reading a novel. Or deciding a court case. Or perhaps reconstructing a “what really happened” crime scene. That’s because Volume 3 contains the story of the Philadelphia Bobbies, Eddie Ainsmith, and Leona Kearns, their disastrous trip to Japan to play against men’s teams in 1925, the abandonment of three players, and the death at sea of one of them. 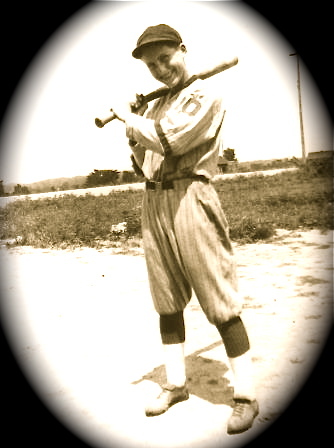 Contrasted to the tragedy of that story, Research Notes, Volume 3 also contains the exciting story of Margaret Gisolo, who helped lead her 1928 American Legion Junior Baseball team to the state championship. Margaret later played for Maud Nelson’s All-Star Ranger Girls, and later still founded the Department of Dance at Arizona State University, where she was a much loved and highly respected professor. The book also tells the story of Leona Kearns’ younger sister, Nellie, who, along with Margaret, played with the All-Star Ranger Girls. Volumes 1 and 2 have worked in the way I wanted them to. They are used by baseball researchers looking for information that might help them learn more about a team . . . an individual . . . a rare photograph. They are also used by teachers, and in more imaginative ways than I would have considered. Some teachers, for example, use the books to teach about sports journalism in the past . . . about the manner in which women athletes were written about . . . even about clothing styles. If one must spend five years sifting through thousands of pages of accumulated articles and arranging them in a useful order, then it’s a reward in itself, to the writer, that the final volume is the most exciting. And a reward to the reader, too, I hope. 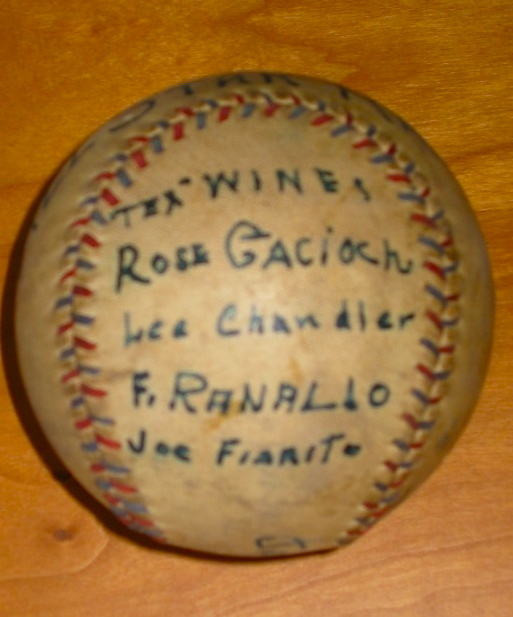 Baseball signed by the 1934 All-Star Rangers players. My father was born in Croatia (which a few years later became part of Yugoslavia) after his father left for the United States. Almost fourteen full years went by before my father saw his father. 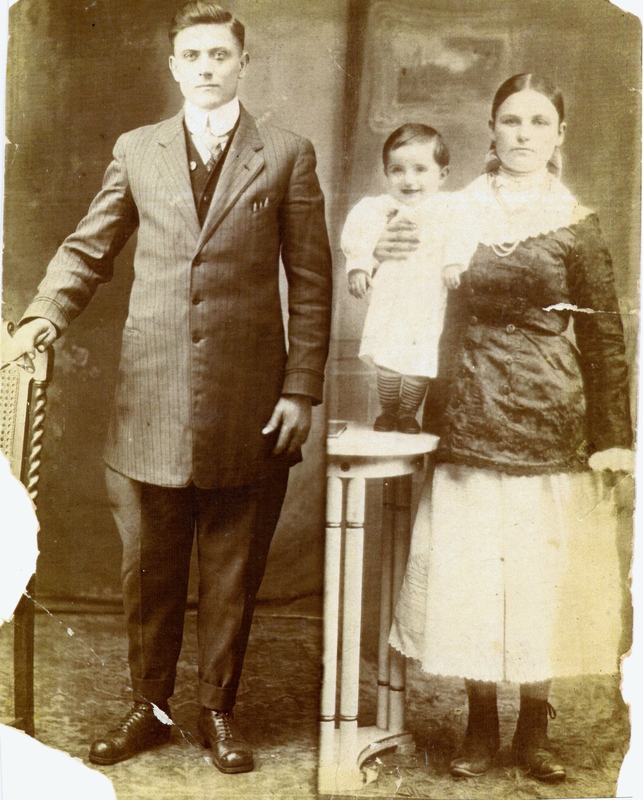 And yet, our family album contained this photo of my grandfather, my infant father, and my grandmother, standing side by side. Don’t believe everything you see. My father explained to me that two different photographs were taken, one in Croatia, one in the US, and then they were composited into one photo, so that both my grandfather in this country and my grandmother and father in another country could each have a family portrait. My father told me that many immigrants had such photos made. Apparently there was a desire for such photos, and up sprang the clever services that provided them. The line separating my grandfather “here” from my grandmother and father “there” was more formidable than the invisible line in the photo. The wide line of the Atlantic Ocean separated them. 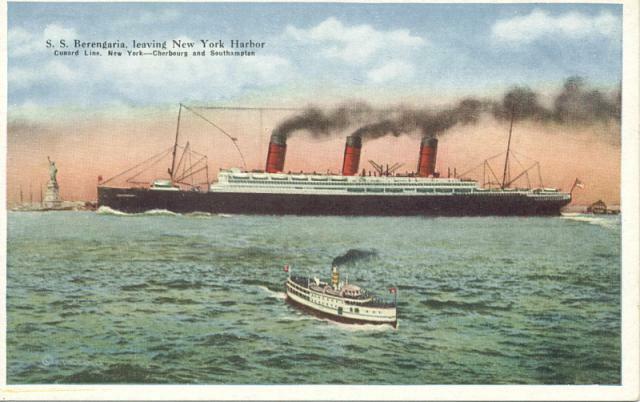 To cross that line, money had to be paid as passenger fare on one of the Cunard Lines immigrant ships. After fourteen years of digging ditches in Pennsylvania and working in a foundry in Ohio, my grandfather, Marko Grguric, earned enough money to pay for passage for his wife and son. Thus my grandmother and grandfather were finally reunited, and my father got to meet his father. More than once my father shared with me the story of his childhood in a small village in the mountains of northern Croatia. He was a child who yearned for his father and later, as a young boy, he craved to leave the place where he was always hungry. I wrote a picture book telling the story of my father’s childhood, and I titled the manuscript The Line Between. For years I tried to sell this manuscript to editors at various publishing houses. The rejection letters I received contained a mixed bag of comments, ranging from “compelling” and “well written” to “immigration stories are tough to sell” to “too quiet.” There were also outright “not for us” responses and no responses at all. Just as in my father’s childhood, so in publishing there is a formidable line. In publishing, that line separates what editors deem right for the company they work for and what they deem not right — the “not” including a wide array of manuscripts ranging from poorly written to poorly told, to stories that are well written and well told but won’t earn a profit. For most editors who rejected it, The Line Between was a well written story that was “quiet” and therefore would not, in their opinion, sell. All writers I know of have unpublished manuscripts stored somewhere: file cabinet, box in the basement, or computer. I am no exception, and The Line Between is not the only unpublished manuscript on my computer. Like many writers, I don’t give up on a story I believe in. A Confederacy of Dunces took sixteen years before an editor bought it. Louis L’Amour collected 200 rejects before selling his first book. And so I continue to submit The Line Between to picture book editors. I just hope that selling the story to an editor doesn’t take fourteen years.